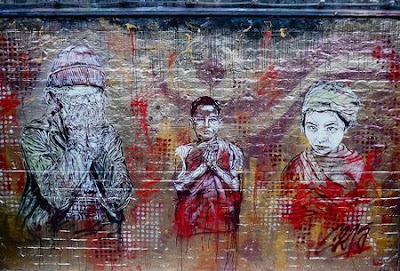 I see from Romanywg's flickr that french Stencil artist C215 is back in London and has been hitting the streets of East London again with some new work. Pictured above is some work he painted in Cargo earlier in the week. Also in the Cargo's courtyard is some new work from Bruno Leyval. Check Romanywg's flickr who has photographed the artists at work in Cargo. I also came across this great short film from AfroBreak, documenting C215's travels to Brazil last year, not sure when the video was posted but I hadn't seen it before. The film documents C215's travels into the favelas as he finds spots to paint on the streets. It follows him into the homes of some of the locals where he decorates their walls with his work and also shows him giving a master class to the local Kids on how to cut a stencil. there´s a brazilian guy named Miguel Cordeiro and he was one of the pioneers of graffiti in brazil in mid-late 70´s. he lived at new york – east village in 1982/83 and his BLOG shows his visual works and writings on music, culture, politics etc.